Rebecca encouraged folks to use their Modern Quilt Guild membership benefits and check out the webinars, free patterns and other options. She suggested checking out the write up on Quiltcon and the latest webinar on Perfection and Procrastination. We're looking for a Project Manager for the Quiltcon 2017 Charity Challenge. This year’s challenge requires participants to work collaboratively to create completed quilts using a predetermined color palette while crafting a design that plays with scale. You can get more info here. Let one of the board members know if you're interested. If the guild is going to participate, we must sign up by July 30. You'll have lots of support, but we need a leader/coordinator. We may have a new meeting location lined up for June. Our May meeting is at Leslie Jennison's house. Information on the May Mercado will be on Facebook. It is open to all members and our current sponsors. Next retreat will be at Creations' Main House on Labor Day weekend. You can add Monday if you want. We're expecting Kim Kight, Cotton + Steel Fabric Designer, to present at the June meeting. 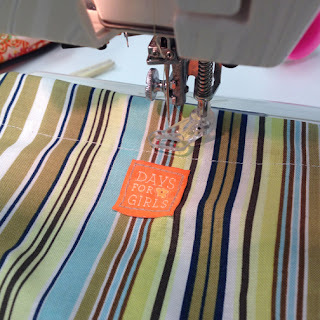 Sarah is trying to work out details for a potential June workshop with double gauze or lawn. Watch Facebook for details. 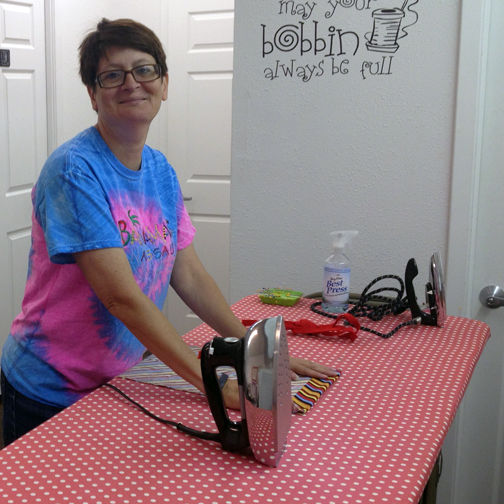 Jen held a charity sew-in Friday after the meeting at Mesquite Bean from 10-closing. 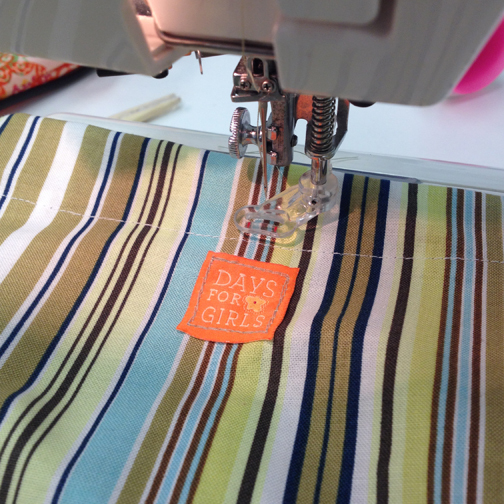 Mesquite Bean is sponsoring the bags charity drive for Days for Girls. Checkout Facebook and the blog post for more info. 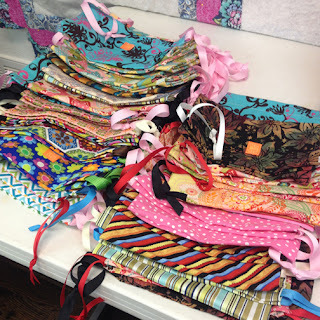 Everyone who donates a bag gets a chance at Succulence FQs donated by Mesquite Bean. Bring your bags to the May Mercado; get a chance to win some fabric. Jen is still accepting NICU blankets for Threads of Love and will continue to accept bags for Days for Girls, but every 2 months she'll issue another challenge for a different charity. Sarah J won the April BOM blocks, but she did stack the deck a bit, contributing >20 blocks. She got the Sew Inspired ruler to square them up the 30 blocks she won.. The next BOM is called A Quilters Table. Watch Facebook for details. Members talked about their inspiration for the President's Challenge. There is so much diversity in our guild and so many different inspirations in the world. An album cover, song, painting, person, animated character, book, daughter/artist, movie, and video game were all cited as inspirational items by members. This challenge, due in August, is going to be something special. Rebecca will be looking for updates at the June meeting. Our presentation was on the principles of design by our own Suzy Armstrong. She gave us some theory, some rules, and a lot of examples, explaining how principles of design relate to principles of modern quilts. It was a very interesting, enlightening, and educational presentation. I'm thrilled to report the results from our sew-ins have been great! 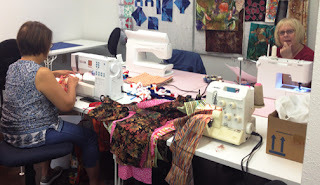 Thank you to Mesquite Bean Fabrics for hosting our two events. A small, but mighty army of stitchers went to work. 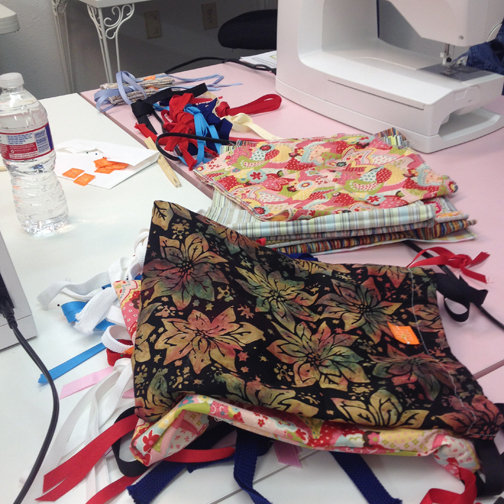 We had the serger set up and rockin' along. And we had the ironing station moving at a brisk pace. The easy easy assembly line was in full swing. With a couple finishing touches, we were able to finish every pre-cut kit in the box! If my math is right (cough, cough) I think we will be able to share at least 80 bags with the organization at our May meeting. I encourage you to keep stitching! A representative from the San Antonio chapter will be joining us in May to receive the sewn items. We will also be awarding our randomly drawn volunteer prize, donated by Mesquite Bean, at the May meeting, too. Keep up the amazing work and we'll see you in May! ps- If you are a member with specific questions, ask them in our closed facebook group.